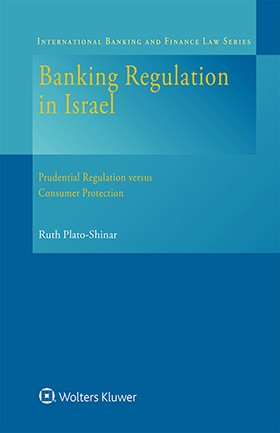 Banking Regulation in Israel: Prudential Regulation versus Consumer Protection, unique in its kind, provides broad and comprehensive information about the Israeli Banking System and its regulation. Among the globally competitive countries that withstood the global financial crisis of 2008 with no significant disruption, Israel stands out, suggesting that other countries might benefit from an in-depth analysis of its banking system. Thus, the conservative characteristics of the Israeli Banking System subject to tight and effective regulation have now become a broad global interest. In light of this growing interest, this book serves as an exclusive source of information of Israeli banking law and regulation, and focuses on the most up-to-date global banking regulation issues, as reflected and implemented in Israel. Even though the book focuses on the Israeli system, the Israeli circumstances only serve as a test case for the analysis of broader issues that affect many other countries. new models of banking regulation, such as self-regulation and contractual regulation. The book focuses on the relationship between the two main banking regulations: prudential regulation and conduct of business regulation. Unlike the “Twin Peaks Model” that prevails in many other market-based economies, such as the UK, where these two fields of regulation are divided between two different regulatory agencies, in Israel, the Supervisor of Banks is responsible for both. The book aims to examine the suitability of the “Twin Peaks Model” for Israel, and whether both the regulations should remain in the hands of the Supervisor of Banks. The book devotes a significant portion to the architecture of financial regulation, while providing a roadmap for the development of a suitable banking regulation model. This is of great value to regulators, lawyers, and business persons connected with banking in general worldwide, particularly in the aftermath of the global financial crisis, when many countries are re-examining their model of financial regulation to prevent another such crisis. In addition, since most pertinent Israeli material does not exist in English (including statutory enactments and official reports), the book enables non-Hebrew readers to become familiar with prevailing Israeli Laws and regulations, and to obtain a considerably detailed description of the current legal and regulatory situation. CHAPTER 5 Prudential Regulation versus Conduct of Business Regulation: Consolidation or Separation?